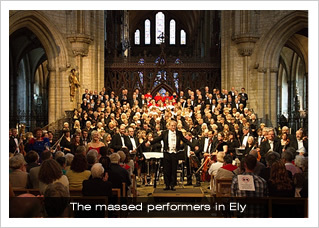 This evening the Boys’ Choir joined a number of adult choirs and a huge orchestra from across Cambridgeshire to perform in a Jubilee Concert in Ely Cathedral. 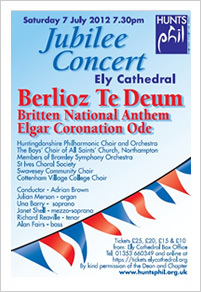 As well as singing their independent choral part in Berlioz’ gargantuan setting of the Te Deum, they added their voices to Britten’s arrangement of The National Anthem and Elgar’s Coronation Ode. Saints favourite: Bairstow’s Save us, O Lord! After a much appreciated Pizza Express dinner it was time to get robed and on with the show. 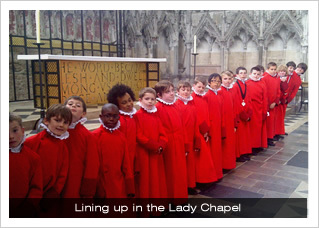 The complex arrangements for getting on and off stage worked a treat, and the boys’ voices soared from high above the floor, projecting down the full length of the Nave. 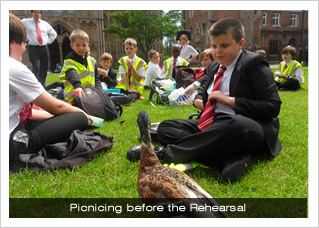 The concert went exceptionally well, thrilling the packed Cathedral, and it was on fine form that the boys travelled back late into Northampton, the coach shaking to the full force of their fully-warmed up voices as they proved their versatility with a quick run-down of the greatest hits of Bruno Mars. This is the last concert for the choirs until the first of what we hope will become an annual St Ceciliatide concert on Friday 23 November 2012 at 7:00pm. Please come back to the website in September to find out more information.